How to “reset” an Arduino board? So, now, I can't upload anything anymore, because the IDE says "port already in use". Is there a way to "reset" the Arduino without another programmer? Nothing else is using the serial port, and everything went just fine until I uploaded the previous sketch. Press Ctrl + U to upload your code. If unsuccessful - got to 3. There is a delay before the boot loader starts the programs, just work on your timing. It worked for me when a bug in my Arduino's code was executing a soft reset every 500 ms. I had the same problem on two Arduinos (one Uno, and one Modern Device Freeduino/USB Host board) and the window between reset and the beginning of serial port usage was so small that it was impossible to upload. You can overwrite the bootloader on your Arduino to gain more space. Once the bootloader is overwritten, the board will boot faster. It will quickly fix Arduinos that you block in the future. You can now safely experiment to find ways to prevent serial port usage from locking up the device in the future. Make sure you plug arduino directly in computer and not through a hub. Using a hub will give you this error. Based on my experience with the communication already in use or blocked I would say that the program you are interfacing with still has the communication open. I also found that if you disconnect the USB cable it will rest the communication. It is not the greatest solution but it solves the problem. I hope that helps. I just spent the last 5 hours searching for a solution to this problem (serial port COM3 already in use, grayed out serial port)...I tried everything every forum I could find suggested, including this one..
What finally fixed it (got rid of the last code i'd input that got stuck and uploaded simple blink function)? 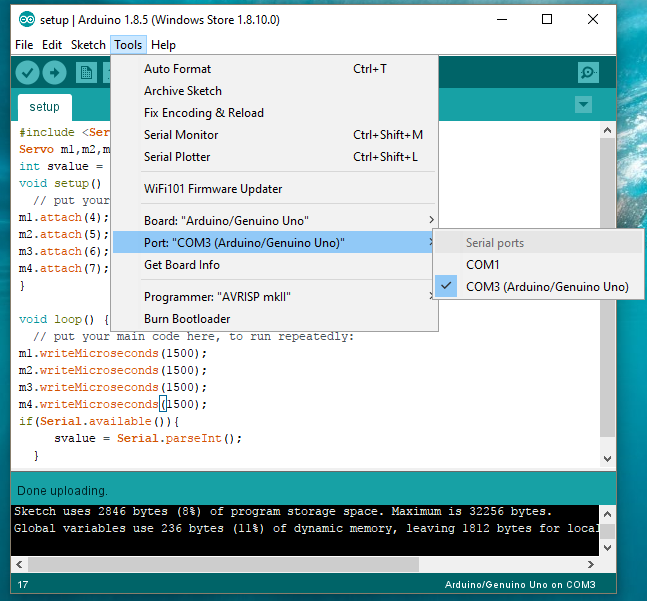 Follow this link -- http://arduino.cc/en/guide/windows and follow the instructions for INSTALLING THE DRIVERS. My driver was "already up to date", but following these steps fixed the glitch. I am now a happy camper once again. Note: Resetting the board manually with the button on the chip, or digitally through misc. codes on the internet did not work to fix this problem because the signal was somehow blocked/confused between my arduino uno and the port in my laptop. Updating the drivers is like a reset for the "serial port already in use" problem. Be sure you are not accesing the serial port from a terminal, that loop (or any code) should not prevent the Arduino from being programmed. If you still have the serial console open, it will reserve the serial port. Close it, and try again. For Arduino Yun users, try uploading via Ethernet/WiFi (Tools->Port). I had exactly the same problem, I tried pretty much everything (apart of burning new bootloader). I am surprised it worked, but I've uploaded empty sketch without any problem. If i power on myarduino There is delay before uploaded program execute. Unplug any connection to arduino pins before upload. then plug in the Arduino and see how the output is formatted. This stopped X from accepting the keypresses and allowed the Arduino IDE to program finally! continue holding and upload the sketch. Once it's done uploading release the reset button. Instead of loading your new codes to the arduino using the "upload button" (the circle with the green arrow) in your screen, use your mouse to click "Sketch" and then "Upload". Please remember to add a delay() line to your codes when working with serial.println() and loops. I learned my lesson the hard way. That work for me, I hope to you too. If the port says Already used, then you are probably using the wrong port. switch it to the port were you connected your arduino and then try to re-upload, you will definitely see it work. You will see the 'Hello World' outputting script will be shown as comment, so you can click [upload] safely. Hope it help. 1.First of all connect you aurduino device . 2.Then go to device manager and uninstall driver. 3.Now remove your aurduino device. 4.Again connect you aurduino device to your system. 5. Now install your driver (which you have uninstalled earlier). It will free your port for sure. Not the answer you're looking for? Browse other questions tagged serial-port arduino reset or ask your own question. In plain English, what does “git reset” do?